One day this fall, while sitting on the front porch somewhat dazed with the day’s events, tears streamed down my cheeks, my stomach rolled over in a knot, and then I cried from deep within my belly. Letting it go opened my eyes to my heart. Angrily, I pounded my fist on the bench, and to no one I muttered, “This is not the life I planned.” With this recognition the tears stopped. I stormed into the house, grabbed paper and pencil, and began to write. Rather than writing in story format, I found myself making a list of obligations: grandma, family, husband, dog, friends, golf, football weekends, house, chores, and even more excuses or things to blame than I can recall. The tears and frustrations wore me down, and I enjoyed a relaxing afternoon siesta. Upon awakening I realized that my list should have read: “Letty’s List of Excuses.” It felt like being in a comic strip. The next frame read: “What to do Next?? ?” Third: “Make a Plan! ?” Last: “But, it’s dinner time, and I have things to do!”–imagine the foot kicking the cabinets. During the night I remembered seeing a young writer’s schedule and notebook. 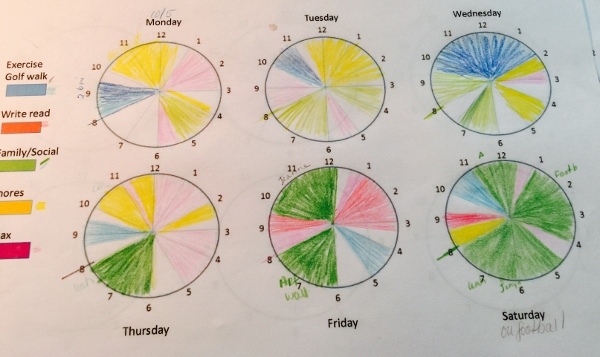 She colored coded a clock face with every activity she performed throughout the day. Smarter than that, she blacked out three hours daily to write. As she explained, “Three hours is the least I can do and expect to be a writer.” At breakfast I drew a clock, and made a list of categories. Handing it to my husband, I asked, “Could you please use your computer to make a series of six clocks on a page with a ‘legend’ on the margin? It would help me so much to know where my time is going. The excuses have me worn down, and it’s nobody’s fault but my own.” We reflected on a time in the early nineties when we each followed a Franklin Planner to keep our lives on track. By noon he handed me the clocks, and I produced the colored pencils. We played with our creation for an afternoon. I’d like to say that in twenty-four hours I managed to take back my life. The truth is that it took another month of diligently color coding those clocks before I honestly understood how I had given away my life. The twelve-hour clocks were mostly colored in greens (family/social life) and yellows (chores/errands). What I wanted to see were more reds (writing/reading) and blues (exercise/golf/gardening). After a week my mind yelled, “Relax!” so I added a soft purple box and began making time to relax. I smiled with relief. I still spend time with family and friends. I do it on my schedule, not at the whim or whine from a phone call. For the moment, I’ve reclaimed my life, or maybe just today. It’s raining. It’s cold. I’m inside and writing. No phone calls. No meetings. I’m writing. After retirement and a move, I readily admit that I lost control of my life’s dreams, to finish a novel. The color coded clocks redirected and helped me find my path. Letty Watt loves to share stories that people can relate to. She has been writing stories on her blog, Literally Letty, since 2010.